Steinbeck called it the Mother Road in The Grapes of Wrath and it stuck. Bobby Troup told us to get our kicks on it and we still do today. It’s the America that escaped from the corporate maw. At 2,448 miles, Route 66 is the longest, thinnest neighbourhood in the world. People have friends hundreds of miles each way, from Chicago to Los Angeles. Since the Twenties it has taken dreamers and refugees to the land of milk and honey. It is The Way West. Great tracts of it are still there. Driving across the rolling Oklahoma prairies, my son Mat’s van started overheating. We cruised gingerly through Tulsa, past signs for Broken Arrow, Mustang and the Chisholm Trail. Yukon, Oklahoma, said ‘Home of Garth Brooks’ on the water tower. We drove on. No time for New Country. The Tradewinds Motel in Clinton, Oklahoma, a Sixties classic, sits on Route 66. Built by a retired vet, it was Elvis Presley’s favourite. Halfway between Memphis and Las Vegas, the King stayed here four times. We stopped there on July 4th. The office walls were covered with 66 wallpaper – Chevys, cactuses, motels and all. ‘I guess the Elvis suite is booked out for months?’ I asked forlornly. Nope. It was free. What? Independence Day, and Elvis’s bedroom is free? Did the world’s Elvis Fan Clubs know of this? The retired vet, now in his late eighties, told us about Elvis’s visits here. The first three times, the Cadillac caravan arrived at dead of night and Elvis stayed holed up in room 215 with his boys next door ordering room service until, burgered up and ready to rock, they slipped off again. No one saw them and Doc was sworn to secrecy. The fourth time, the housekeeper delivering meals saw the King through the door and ran through Clinton spreading the news. Townsfolk gathered below the balcony. Elvis came down and played ball with kids in the parking lot then drove off and never came back. 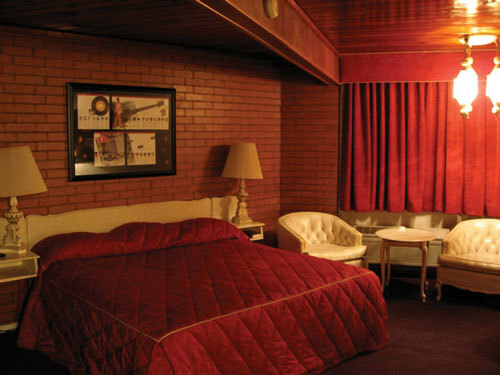 Room 215 has been a shrine ever since, with the original kingsize bed, vanity table, daybed and bathroom fittings from Elvis’s days. I’d always been frustrated by Graceland’s pious refusal to allow us upstairs to see Elvis’s bedroom or lavatory, a place too holy for us ordinary folk – ‘That’s where Elvis passed on.’ Well, eat your heart out Memphis, Clinton’s the place to be. Better than Graceland, we could sleep in Elvis’s bed, sit on his very toilet. On the other side of the road is the Oklahoma Route 66 Museum. It tells the story of the Mother Road decade by decade, from Thirties dust bowl Model T Fords through Seventies hippy-flowered microbuses. The curator told us of fifteen hundred Harley riders rumbling past the week before. The van had recovered in Elvis’s parking spot. The ‘Check Engine’ light went off. Elvis heals in wondrous ways. He guided us to Jiggs, another of Clinton’s treasures, a smokehouse full of truckers eating bunloads of barbecued pork, where we bought a bag of the best and cheapest jerky (sun-dried beef, cowboys’ staple road food) anywhere in the States. Elvis stayed with us. Kept us cool. Temperature in the nineties but no overheating. By Sayre it was 100 degrees outside Beckham County Courthouse, featured in The Grapes of Wrath. Erick is a dusty one-intersection town, home of King of the Road Roger Miller. The West starts here. We rolled through under the big skies, grain elevators poking out of the flatness like missile silos. We high-tailed it across the Texas panhandle, kissing a sliver of the Blarney stone in a hunk of green concrete in Shamrock and marvelling at Groom’s wonky water tower – the Leaning Tower of Texas. Hot winds welcomed us to the high Staked Plains. We stopped at the Big Texan on the edge of Amarillo for a tea-time steak. Inside we met a New Jersey madman who was running the entire length of Route 66, repeating the foot-flattening Bunion Derby of 1928. Twenty miles a day in the maddening desert heat. But then Elvis abandoned us bigtime. After our steaks we found Mat’s van had been smashed into and everything I had – passport, money and credit cards, clothes and cameras – had been stolen. All I had was what I stood up in. No identification. I was the Man with No Name. Stripped of any identity, things were refreshingly simple. No options – no worries. 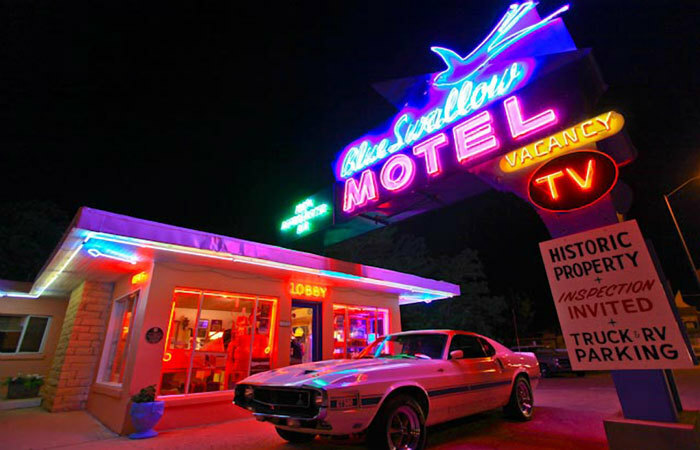 We headed for the safe haven of the Blue Swallow Motel in Tucumcari, blue neon under a full moon, another sweet piece of Forties timewarp full of 66 memorabilia. Neighbourhood pals of the Big Texan, they took care of us after our smack in the face. Stretches of 66 rise and fall like a sleepy switchback inches away from the Interstate which slices through the landscape with its thundering cargo of 18-wheelers. It feels like driving through the Forties with the future ribboning alongside. Grants, New Mexico, a mining ghost town, had a uranium mining boom in the Fifties. Its legacy is a series of Korean-owned motels, ours the astro-turfed Leisure Lodge. Mile-long freight trains rumbled through the night under the full moon. Grants’ jewel is the beguiling Uranium Café where we sat on mauve leatherette banquettes under a mauve ceiling and gobbled nuclear breakfast burritos served by born-again Christians. A couple of days on down 66 an old man with a Swap-Meet (car boot sale) in the roasting New Mexico desert put a smile back on my face. Tom Lamance, 87, had sat there for sixteen years in a roadside shack surrounded by junk and hubcaps. ‘Came here in ’85. Used to be an auctioneer. Guess I kept more ’n I sold.’ Outside in the fierce sun thousands of hubcaps dazzled and blazed. One in a distant row called me. I got to it and found ‘GP’ in the centre. We were heading for Joshua Tree, Gram Parsons’s last resting place. It was befriending Gram in 1970 that caused my messianic derailment into the emotional world of Country music. A cosmic coincidence? Tom told me it was from a Seventies Pontiac Grand Prix. My blood froze. Twenty-five years ago I drove down 66 past here in a… Pontiac Grand Prix. After sixteen years in the desert, Tom had become a shaman and was doing a Castaneda on me. Back in the hippie days we called it f*cking with my mind. Another must-stay is El Rancho in Gallup, full-on Thirties Hollywood Western style. The film stars’ favourite, with rooms dedicated to Gregory Peck, John Wayne and Ronald Reagan, it’s full of chunky Wild West motifs, Navajo rugs and stagecoaches on the sofas. The lobby is a palatial log cabin film set. I was happy to stay in the John Wayne room, where the Duke luxuriated in two queen beds with wagon wheel headboards. What finally wiped away my pain was the wacky Wigwam Village in Holbrook, Arizona, surrounded by the Painted Desert. Built in 1950, fifteen concrete wigwams have been lovingly restored. 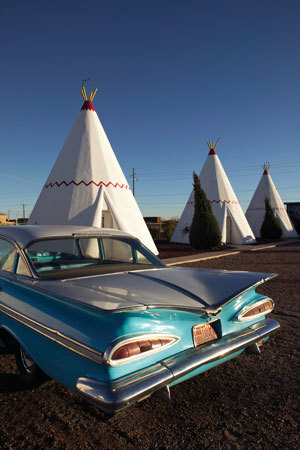 Classic cars sit outside the wigwams. Inside the bedroom is circular and inclined. Everyone should stay at least once in one of these concrete wigwams. They are at the heart of Route 66. The Mother Road? Well, it was a mother to me. Main Street of America? Yep, I’ll buy that too, even if it is the America of memories and dreams. What is America to us but the movies?